Song on repeat: Days in the Sun - Beauty and the Beast (I saw it twice over Easter). What about Mind attracted you to your role? I knew about Mind before I started working there. A number of my family have struggled with poor mental health, alongside some close friends too, and so I was familiar with Mind’s work in the area. What attracted me about Mind was how well they’ve challenged people’s attitudes towards mental health. I wanted to play my part in that. My role at Mind (and Whizz-Kidz) is about connecting companies with a cause. I love the challenge! I love having the opportunity to talk to people about our work and help them see the importance of what we do. I love facilitating connections and seeing partnerships come to life. What misconception about mental health in the life of a Christian have you found to be most damaging? How does Jesus correct it? I remember discussing with a friend how sad it is to believe it’s not okay to suffer from mental health problems as a Christian. It’s a sad reality that mental health problems are common. I’m certain it was not what God intended at creation but it’s damaging to dismiss mental health problems for that reason. They can affect us all so we need to address that. Thankfully the Bible does address it. Mental health is prevalent throughout the Bible. All you need to do is flick through Psalms and you experience David’s anguish, hurt and anxiety. Psalm 88 is one of the few that shows us that sometimes, there isn’t a high at the end. There is simply deep bouts of depression and long periods of ‘nothingness’ where we feel so far away from God, as if he’s just not with us. The Psalm ends saying ‘darkness is my closest friend’. I’ve heard that, for some, that is exactly what it feels like. There’s Jonah, who declares ‘it would be better for me to die than to live’…Naomi, who wants to be called ‘Mara’, because the Lord has made her life bitter (which is ‘Mara’ in Hebrew) …even Jesus dealt with paralysing anxiety and sadness about what lay ahead of him before he died. We’re not alone. God’s people have experienced anguish, despair and sadness too. Being a Christian does not make us immune to mental health problems. Thankfully, we read these passages in the context of hope. Jesus brings certain hope. The Bible can show us mental health problems are a human experience and Jesus shows us that they don’t define us. He defines us. How has your view of ‘good mental health’ changed over the years? What do you wish you’d known five years ago? I’ve come to see mental health the way we see physical health. Just like we all have physical health, we all have mental health and it’s important to look after both! Five years ago, I didn’t spend much time thinking about my mental health. I wish I’d known that it’s important to make time to look after it. How can girls like us make a difference in our friends’ lives who struggle with mental health problems? ● Ask how they’re doing and suggest to spend time together. Don't wait for them to say ‘I need help’. ● Don’t say things like, ‘Cheer up’, or ‘I’m sure God doesn’t want you to be like this’. ● Get outdoors! Organise a walk or trip to the park - exercise can be really good for mental health. ● Sometimes it can be right to suggest they seek advice - whether going to the GP or counsellor (Christian or not) or speaking to their youth worker or vicar. You could offer to go with them. ● Be patient. Continue to show you’re there for them and be mindful of triggers that could exacerbate their problems. You might be just the person to spot what they are and when they might be struggling. ● Take time to look after yourself, maintaining the time and distance to be able to help someone else. ● Pray for them or offer to pray with them if you feel it’s appropriate. Prayer is powerful and I know of people that have seen vast improvements in their mental health through prayer. You can be a real source of friendship, love and support for your friends and a great witness to them too. Kitty lives in London and goes to Holy Trinity Clapham Church. Kitty studied Theology at Nottingham and completed an MA in Christianity & the Arts. 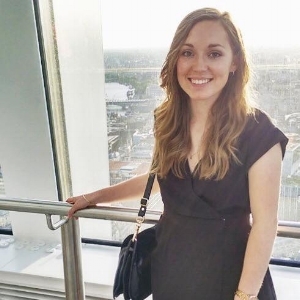 After completing the Charityworks graduate scheme, Kitty worked for Mind – the mental health charity. She now works at Whizz-Kidz (a charity providing wheelchairs and life skills to young disabled people). Kitty is getting married to James in September and is busy planning the wedding! She loves stationery, eBay bargains and being creative. Kitty also has the privilege of calling Beatrice and Florrie Born cousins, both of whom are City Reps for More Precious - they’re amazing.